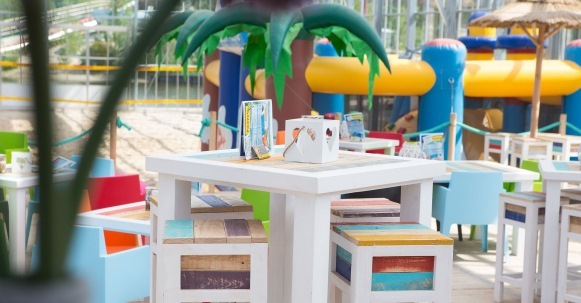 DaysOut.NL - Happy Fun Beach: every day a sunny day at the beach! reviews and trip information Rheezerveen overijssel. Happy Fun Beach: every day a sunny day at the beach! Visit the website of Happy Fun Beach: every day a sunny day at the beach!. Let the weather forecast be, a day at the beach is always a possibility at Happy Fun Beach. This gorgeous indoor beach has, besides sand, also beach volleyball courts, climbing walls, bouncing castles and a fun bar. Outside there's a big lake where you can swim and enjoy the beach. The ideal location for a fun day-out with the whole family, a sunny family day-out or a company trip. You can also just have a cup of coffee while the kids knock themselves out at the beach or on the bouncing castles. Whether you want to relax with a bite and a drink or want an active day, Happy Fun Beach suits you. Bring colleagues or family for a cool game program like Beach games, Expedition Robinson or Fort Boyard and enjoy a delicious buffet or barbecue. A day at the beach only ends when you've eaten the most delicious bites of the Tapas restaurant Overijssel. Or barbecue with the whole group! In combination with other activities they'd like to offer package deals especially for you. This attraction Happy Fun Beach: every day a sunny day at the beach! in Rheezerveen is suitable for corporate activities, ladies day, childrens party (vanaf € 12,50 p.p. ), themafeest and vrijgezellenfeest. Ask a question Happy Fun Beach: every day a sunny day at the beach! or ask an offer. Telephone: +31 (0)523 638 260. Prices for a day card. This includes access to the lake and day activities of Happy Fun Beach, like beach volleyball and climbing the tree. Children under three have free access. Different prices for package deals. Childrens Party: from € 12,50 per person. Data last checked on 15 mei 2018, disclaimer. Open all year round (watch the opening days). From 12:00 o'clock To 18:00 o'clock. Note: Opened every Saturday and Sunday from 9 AM. In the holidays opened until 11 or 12 PM. Activities should be booked in advance. Visit the website of Happy Fun Beach: every day a sunny day at the beach! or ask a question. Create your own review about Happy Fun Beach: every day a sunny day at the beach!